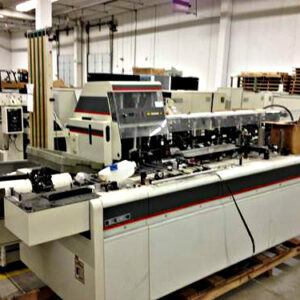 Mailcrafters Pro Mailer 6.0 High Performance Inserting Machine - Roberts Business Machines, Inc. Introducing new line of gripper-arm style 2 and 4 station office environment inserters specially developed to offer simplicity, economy and top production quality to the lower volume market. This market segment traditionally the target of tabletop and low volume solution manufacturers now has an alternative. You can now choose a full-frame, small footprint floor console model machine, offered at a competitive price. This new line of inserters competes very favorably on an economic level yet does not compromise the full features generally associated only in heavy-duty production shop models. 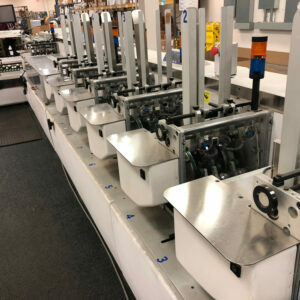 Inserter separates and collates documents for insertion by vacuum at the individual stations allowing high-speed runs with less error, positive separation between documents and ease of set-up and running. Built in auto-set detection in gripper arms check every document pulled out of station for multiple or missed documents. The detector will stop and indicate any problem to the operator. Full color operator interface displays pertinent information while running in an easy-to-read, operator friendly format. Help screen displays production data, and trouble shoots for possible problems in the inserter. No tools necessary for set-up – handy knobs and levers offer simple adjustment for variable sizes. Easy-fill water system for envelope sealing can be removed for cleaning and no-mess refill. Large, clear safety window allows for operator safe tracking in raceway system. Two-hand start switch keeps operators hands in a safe position while inserter is being started.